Opening Reception | Friday, May 5, 6 – 8:00 P.M.
We have found ourselves facing a sobering reality of the fragile and threatened support for the arts. As institutional directions are frequently changing and budgets continually diminished, the very foundations of creative venues and organizations have become easy prey. Institutional, community and civic priorities are expressed – or dismissed – through financial referendums. Currently, this is a global, national, and ultimately local truth. 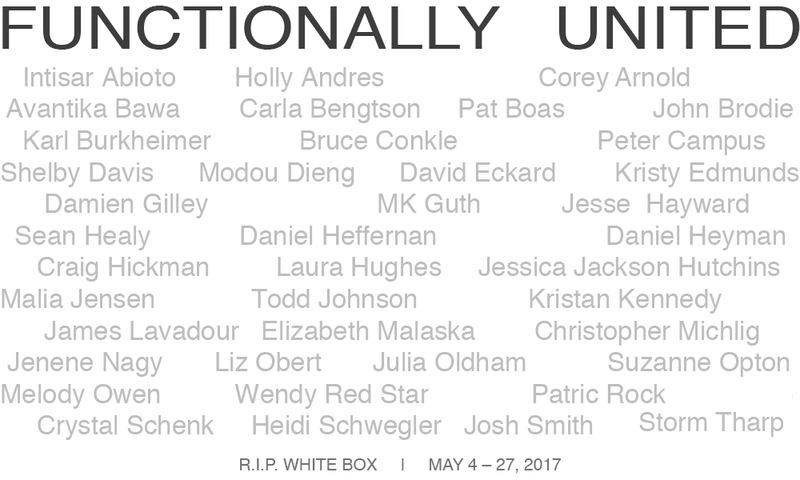 Functionally United will serve as the final curated exhibition for White Box. On July 1, following the University of Oregon Art and Technology graduating exhibition the doors will close for the last time. An important and influential chapter for the Northwest’s arts community will officially come to an end. This final line-up of exhibiting artists is a testament to the impact, depth, and reach White Box has had locally, across Oregon, and nationally. This is not an exhibition where the spacious, room-to-breath aesthetic of displaying work will be implemented, but rather will be a wall-to-wall, floor-to-ceiling collection of incredible talent. A group that formed out of solidarity for one of Portland’s iconic art venues, many have previously exhibited in the gallery and all have experienced, influenced and provoked White Box in some degree. White Box at the University of Oregon in Portland has served as a visual laboratory invested in the exploration and presentation of contemporary critical inquiry in the visual arts since 2010. Located in the historic White Stag Block in Portland’s Old Town Chinatown neighborhood, White Box has a vibrant history of bringing together artists, students, faculty, and regional and global communities to research and present contemporary issues in art and design. This history and collection of exhibitions cannot be properly represented in a statement. But, I am hopeful it will serve as a symbol of White Box continuing to fuel individual artists as well as Oregon’s artistic, social and civic communities long after the lights are off. Please join us in saying farewell.